LONDON, UK, February 6, 2015 (ENS) – The construction of Europe’s longest segregated urban cycleways is set to begin in March, now that the Board of Transport for London (TfL) has approved London Mayor Boris Johnson’s commitment to get more Londoners on their bikes. 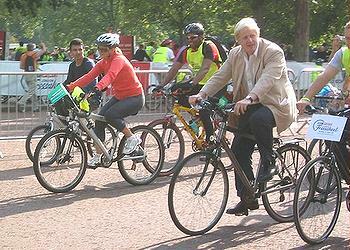 The TfL Wednesday approved the mayor’s plan to spend £160 million (US$245 million) on curb-segregated bike lanes. Criss-crossing the city, blue-painted bike lanes will be divided from the main roads by concrete curbs, a separation urged by cyclists. The biggest investment will be on two controversial “cycle superhighways” running east-west and north-south through central London, opening up what Mayor Johnson says will be thousands of new journey opportunities. The mayor’s cycleway plan will change some of London’s busiest roads and intersections, in some cases prohibiting all traffic except cyclists from making turns that now are legal. Acting on concerns about delays to motorized traffic caused by such restrictions on the east-west route across the city, the mayor changed his plan to retain two westbound traffic lanes on Upper and Lower Thames Street and Victoria Embankment, while preserving the continuous segregated cycle lanes and junctions. The changes reduce the whole-route traffic delay in the morning rush hour, the worst affected time, by 60 percent compared to previous proposals. The delay is now reduced from 16 minutes to just over six minutes in the busiest morning hour, the Mayor’s Office said in a statement. Mayor Johnson said he made these changes because he had listened to those concerned about the east-west route’s impact on traffic, such as taxi drivers. “Thanks to the skill of TfL’s engineers and traffic managers, we have made changes to our original plans which keep the segregated cycle track and junctions, while taking out much less of the route’s motor traffic capacity – and so causing much shorter delays,” said the mayor. On both routes, there would be substantial benefits for pedestrians, with thousands of meters of extra footway, 22 new crossings, 35 shortened crossings and 41 crossings fitted with pedestrian countdown. TfL’s nine-week consultation on the cycleway proposals drew comments from 21,500 people, 84 percent of them favorable. More than a 100 major businesses on or near the routes, including Unilever, Royal Bank of Scotland, Deloitte and Orange, also publicly backed the scheme, as did all parties on the London Assembly. 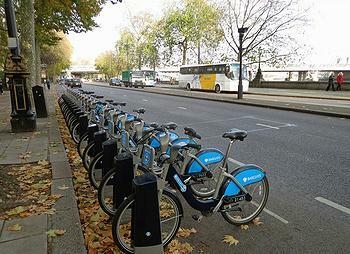 Public opinion polling showed that Londoners as a whole backed the scheme by 64 to 28 percent. “Our task now is to work in concert with businesses and local boroughs to ensure these plans are introduced smoothly with the minimum disruption possible. Further consultations on revised designs for Lancaster Gate gyratory, the East-West route through Hyde Park and Constitution Hill and the junction with Northumberland Avenue will begin on Monday, February 9. TfL also will work with businesses along the route to help manage deliveries in the best possible way, providing advise to enable them to move away from deliveries during the busiest times and help reduce unnecessary congestion across London. Bicycle use in London has doubled in 10 years until today nearly a quarter of rush-hour traffic on central London’s roads is now bicycles. Over the same period, motor traffic has fallen by 24 percent on the Victoria Embankment, or the East-West superhighway, and by 44 percent on Farringdon Street, the North-South superhighway. Between 60 and 70 percent of all traffic on these roads is private cars and taxis. Overall, London plans to invest more than US$6 billion in its Road Modernization Plan, which includes sophisticated traffic signal technology that regulates traffic flow based on conditions at any given time.